Deal Categories: Protein and Energy bars and Bodybuilding.com Coupons.Stores: Bodybuilding.com. BOGO Free. Buy one Protein Brownie (12/pk) & get one FREE for $25. 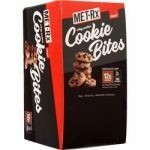 The price on the new MET-RX Protein Cookie Bites drops to $9.99 at All Star Health.